A combination of source inspection and mistake-proofing devices is the only method to get you to zero defects. Shigeo Shingo shows you how this proven system for reducing errors turns out the highest quality products in the shortest period of time. 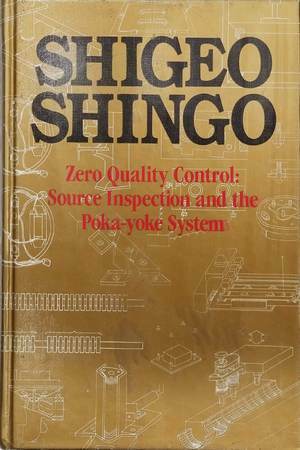 Shingo provides 112 specific examples of poka-yoke development devices on the shop floor, most of them costing less than $100 to implement. He also discusses inspection systems, quality control circles, and the function of management with regard to inspection. This was the first book in English on total productive maintenance (TPM) - a system which has been shown to reduce breakdowns to almost zero and increase worker productivity by as much as 150 percent. In this classic text, Taiichi Ohno--inventor of the Toyota Production System and Lean manufacturing--shares the genius that sets him apart as one of the most disciplined and creative thinkers of our time.